The Form No. LLC-17 - Hours of Work for Minors Under Eighteen (Rev 2-07) is a child labor law poster by the Pennsylvania Department Of Labor & Industry. This poster is mandatory for some employers, including employers of minors. This posting is a list that must be completed by all employers of minors under age 18 listing all minor employees, their ages, and their work schedules. This posting is meant to ensure that minor employees are not required to work more hours than allowed by law. It appears you don't have a PDF plugin for this browser. 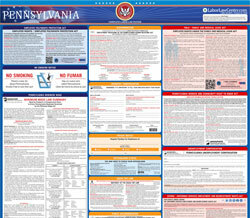 Please see the link below to download pennsylvania-llc-17.pdf. included in daily and weekly hours of work. I hereby certify that the schedules of hours given above are true and correct. Governed by the Child Labor Law. This Schedule Must be Kept up to Date and Correct.